Heavy duty polythene furniture bags can be used protect furniture in short term or long term storage from dust and moisture. Heavy duty polythene furniture bags are ideal for protecting furniture when moving house, in storage or whilst decorating. Heavy duty polythene furniture bags are ideal for ideal for protection when moving house or decorating. Buy quality food bags on a roll. Buy quality heavy duty polythene sheeting. 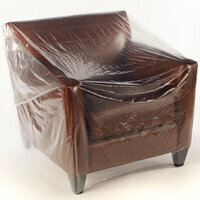 Heavy duty polythene furniture bags will keep your sofa free from moisture and dirt in transit or storage. Size specification: The first measurement gives the width of the heavy duty polythene furniture bags. Our heavy duty polythene furniture bags are made from 200 gauge polythene.